runner to isolate and challenge specific muscles for stronger, more efficient and safer running. electrolyte balance can help improve performance in training and competition. 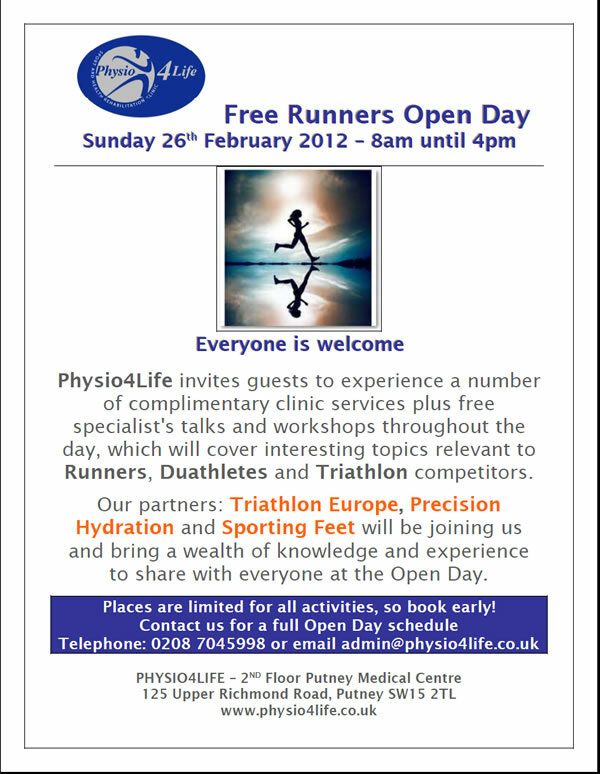 Mark Saunders of Physio4Life is an expert in lower leg biomechanics and well respected in his field. He will give an informative talk on developing your running technique for performance and to avoid injury. He will also discuss the use of orthotics in running. informative discussion on this important topic. Dominic Stead of Sporting Feet will touch on subjects such as the evolution of running shoes, main technologies currently used, what to look for when choosing shoes, how long they last, barefoot vs. conventional and much more. A workshop delivered by Liam Goode of Physio4Life introducing the use of spiky balls and foam rollers for runners to improve performance and to reduce injury. Bridget Sanderson delivers a dynamic class tailored specifically for the runner to isolate and challenge specific muscles for stronger, more efficient and safer running.